When I travel, I try to limit my environmental impact. I don't want to refrain from travelling completely, but when I do travel, I tend to favour ground-level transportation over air-transportation, if distances are not too large (e.g., if traveling over-land would take more than three days, I might fly anyway. A well-filled train usually has a much lower ecological footprint per traveller-kilometer than an æroplane, particularly if the train is hydro-electrical, such as in Sweden. High speed trains and diesel trains are already worse, but still considerably better than flying. But what about ferries Fuel used by (fast) ferries can be quite dirty. On the other hand, ferries may carry over a thousand travellers, sometimes several thousands. 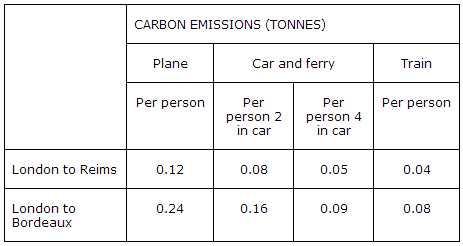 How does the ecological footprint per traveller of a typical, well-filled ferry compare to the ecological footprint per traveller of an æroplane? For example, travelling from Stockholm to Warsaw, one might identify four alternatives with a somewhat similar travel class, where all day trains are 2nd class and all overnight accommodation (train or ferry) is with a bed/berth in a shared cabin. Which one is the most ecological? Caveat: these only take CO2 into account, and there are many other ways transport impacts the environment. Not the answer you're looking for? Browse other questions tagged trains ferries aircraft ethical-travel or ask your own question. How can I find train departure information for Athens - Istanbul? Cancellation with Brittany Ferries on debit card? How reliable are ferries in Puerto Rico? Why do ferries have a trucker's lounge? What ferries go from Sweden to Finland? Are the ferries in Scottish islands reliable?